If you find that you are unable to open saved tables from Saved Tables, or use the Clear Table or Print Table buttons in Table View, it may be because you have selected your browser's Prevent this page from creating additional dialogs option. 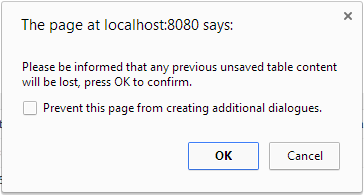 Do not select your browser's Prevent this page from creating additional dialogs option. If you select this option, then SuperWEB2 will not be able to display the message the next time you click one of these buttons. If you have selected the option by mistake, then you can resolve the issue by closing the current browser tab or window and reopening SuperWEB2. This will reset the browser setting.